“The monsoon arrived earlier this week across the northern Top End, bringing welcome rain after the long, uncomfortable build up season of hot and humid days,” said Morgan. Along the monsoon trough Morgan is watching two main weather systems. Out west, tropical cyclone Riley formed off the northwest coast of Western Australia early this morning and is currently a Category 1 system around 195 km to the northwest of Broome. Riley should track almost parallel to the coast, and with conditions in the atmosphere favorable for cyclone development, we expect Riley to reach Category 2 intensity this evening and then Category 3, severe tropical cyclone strength, by late Friday or Saturday. Central Australia has been baking under mostly clear skies, and now that heat is now pushing south, said Morgan. Fire danger is already on the rise through parts of South Australia; and Friday in particular will see higher risk for Tasmania and most of Victoria as gusty northerly winds develop ahead of a cool change expected to arrive during the middle of the afternoon on Friday. The South Australia State Emergency Service has issued an Extreme Heat Warning as maximum temperatures along the west coast peak on Friday. Ahead of that, a top of 45°C (113°Fahrenheit) is forecast for Adelaide on Thursday; and that would only be one degree shy of the all-time Adelaide record of 46.1°C (114.98°F), set during the heatwave of January 1939. And then as we head into the day, temperatures and winds will be on the rise again, and with many fires already burning across Victoria and Tasmania, Friday will be a very dangerous fire risk day. Severe to extreme fire danger is expected across most of Victoria and reaching Very High to Severe across much of Tasmania. Hobart can expect a top of 37°C (98.6°F) on Friday, and in Melbourne we’ve upped the forecast to a sweltering 43°C (109.4°F). The extreme Australian heatwave has led to the deaths of more than 95 wild horses in the outback, authorities say. Rangers found dead and dying animals in a dried-up waterhole near Alice Springs last week. 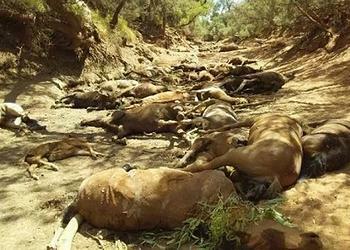 About 40 of the horses had already died from dehydration and starvation. Surviving animals were later euthanized. It has been reported that 120 camels, and many horses and donkeys at the dry water source were extremely stressed and struggling to live with no water and were not in any condition to be transported. The tragedy comes amid record-breaking heat, with temperatures hitting 49.5°C (121.1°F) north of Adelaide in South Australia. The mercury rose to 47.7°C (117.8°F) in Adelaide on Thursday, breaking a record set in 1939. The heatwave across Australia during the past two weeks has broken dozens of records across the nation. Officials nationwide have issued health warnings urging people to stay indoors and minimize physical activity, especially the elderly, the chronically ill and children. 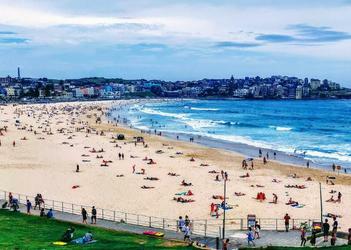 Earlier this month, officials confirmed that 2018 and 2017 had been Australia’s third and fourth hottest years on record respectively. Even if global temperatures are contained to the Paris Agreement limit of a 2C rise above pre-industrial levels, scientists believe Australia is facing a dangerous new normal. Thousands of Australians were forced to evacuate their homes when bushfires blazed across Queensland in November 2018. Australia has committed to reducing its emissions by 26-28 percent below 2005 levels by 2030, under the Paris climate agreement. But on November 30, 2018, students nationwide left their classes in protest of what they called the government’s inadequate action on climate change. According to the United Nation’s 2018 emissions gap report, Australia’s climate policy saw no improvement in 2017, and emission levels for 2030 are projected to be above target. Copyright Environment News Service (ENS) 2019. All rights reserved.